Nuclear waste management, specially the management of high-level radioactive waste created by the reprocessing of spent nuclear fuel is a major cause of concern. Most of the high-level waste has a half-life of several thousand years or more. Many countries store the waste in geologically stable tunnels in the mountains or vaults deep inside the earth till some final solution is found for safe disposal of the waste. These storage facilities are generally hidden from public eyes. However, the Dutch Central Organisation for Radioactive Waste (COVRA - Centrale Organisatie voor Radioactief Afval), have created a unique building at their facility at Flushing (Dutch: Vlissingen). 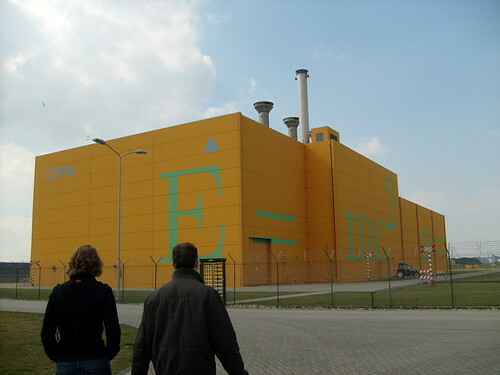 The building known as HABOG (Hoogradioactief Afval Behandelings- en OpslagGebouw - Highly Radioactive Waste Treatment and Storage Building) has a bright orange exterior with huge display of famous equation of Albert Einstein E=mc2, its variant m=E/c2, as well as Max Planck's equation E=hv. 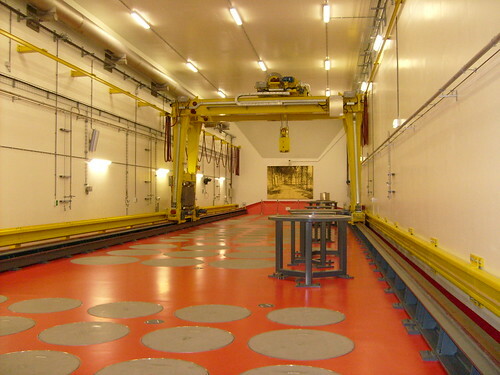 HABOG is an interim storage building catering for high-level radioactive Dutch waste of next 100 years. It is designed to hold the waste for atleast 300 years. The HABOG building commissioned in 2004, is 90 meters long, 45 meters wide. It has 1.70 metres thick reinforced wall and is flood water, gas explosions, bombs, airplane attacks and earthquake proof. The waste inside the building will gradually decay till future generations/ Governments decide on the final disposal of the waste. This process of decay is symbolised by the Orange colour of the building which, as per its designer Ewoud Verhoef, was selected because it is halfway between red and green - the colours of danger and safety and is also the national colour of the Netherlands. Every time the exterior of the building needs a paint it will be repainted in a lighter shade than the earlier coat and it is expected that in about 100 years it will reach white colour by which time the waste would have also cooled down to safe temperatures. Similar theme of decay is symbolised in four large paintings hung inside the building. All the paintings feature local natural scenery with gradual removal of base colours. The final two-tone image is printed on gold leaf, to depict that the waste has more value after its radioactivity has decayed. 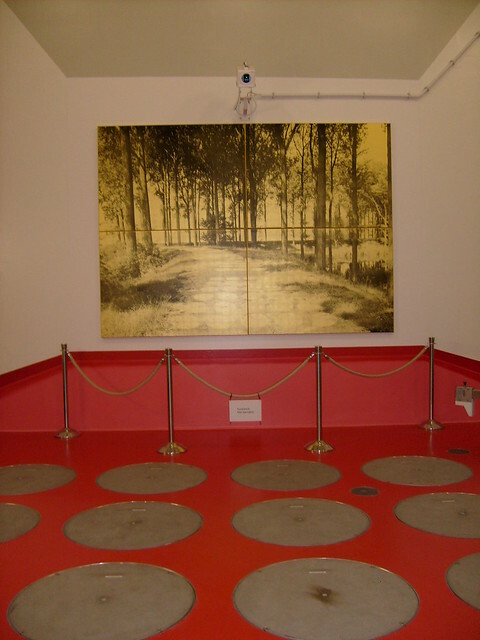 In an effort to better educate the public about nuclear waste management, the facility is open to public visits. COVRA facilities at this location are spread over an area of 20 hectares and besides HABOG, include storage buildings for low and medium level waste. Report (pdf format) on first year of operation by Jan Kastelein, COVRA. (~8.7 MB). It has a good collection of images and explanatory sketches.